For the 17th-century painting of Edward VI pictured here, Zoltan Papp first removed a heavy coat of varnish that had trapped dirt on the surface. A solution was then applied to the back of the canvas to prevent further drying. Paint in danger of flaking was softened with a heated, forklike tool used in applying gold leaf. Peeling paint was replaced with pigments from a Dutch company whose paints are matched to those of the period. The 1920s Spanish colonial revivalhigh in the Hollywood Hills has been owned by Gore Vidal—he of the erudite roar only slightly muted by age—for more than four decades. 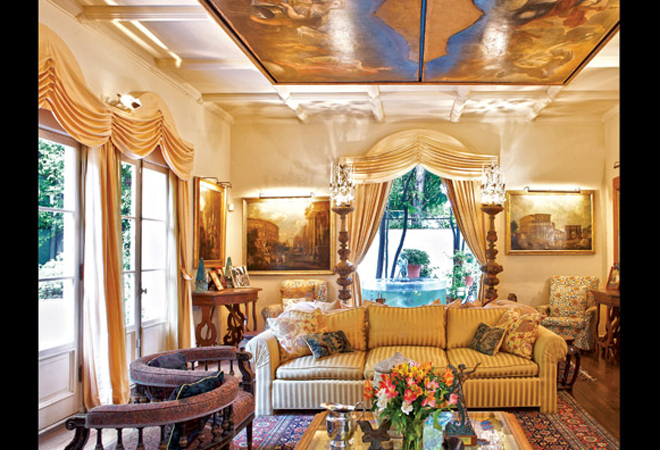 During most of those years Vidal and companion Howard Auster resided in Rome and at La Rondinaia, a cliff-hugging villa in Ravello, Italy, while the L.A. house was turned over to a series of renters. Some, like Nicolas Cage, who put solar panels on the roof, Vidal describes as “very good caretakers.” Others, such as the “lady tenant” who damaged the house and left owing $40,000, garner other descriptors. The couple moved back in 2003; Auster died later that year. A recent seven-month renovation, which focused on the first floor and back terrace, was completed in time for the writer’s 86th birthday in early October. Now, when Vidal isn’t in New York preparing for the Broadway revival this spring of his 1960 play, The Best Man, he savors the flea market finds, the auction house finery overlooked by eyes less curious, the presents from pals that fill the rooms. 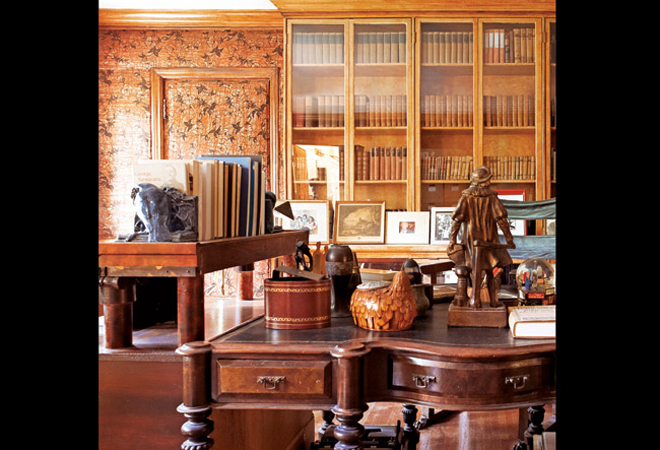 Among them is a herd of 17th-century drawings of warhorses that gallop and rear in the entryway, a gift from Count Edward von Bismarck—”Eddie, the grandest dandy,” says Vidal. 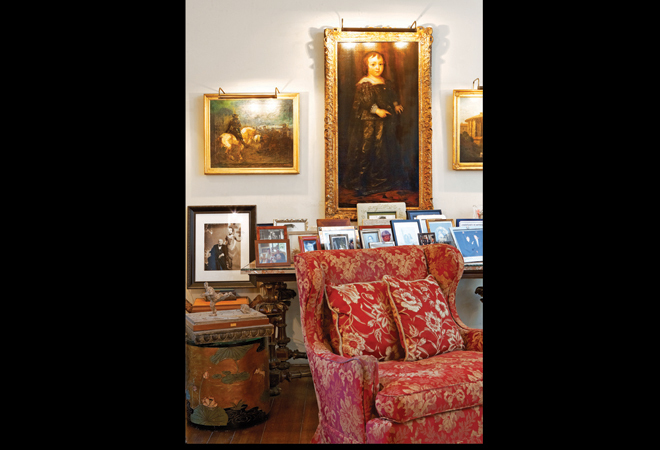 Peering across the living room’s low sofas, marble tables, bronzed writing awards, and photos of friends (Joanne Woodward, Paul Newman, Susan Sarandon, Tim Robbins) is a young Prince of Wales, the future Edward VI, son of Henry VIII. The painting gleams from the ministrations of Zoltan Papp, who was also charged with restoring the legion of Italian 18th-century oils, estimated at $15 million and destined for the Huntington—none of which cost Vidal more than $200. The copies of ancient Roman chairs (right) that had been crafted for the Ben-Hur set in the mid-1950s traveled with Vidal to his Italian homes, thus sparing them from renter abuse. 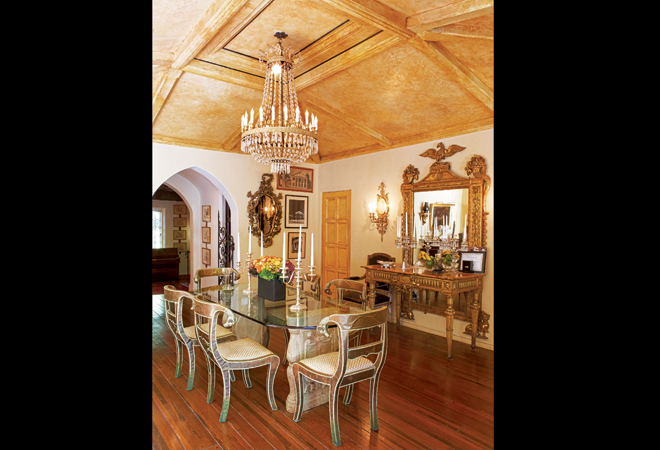 But the brass strips—plated in silver and gold and mounted on the chairs as decorative elements—had loosened with age. Zoltan Papp of L.A.’s Artisan Restoration Centre reattached them and polished the surfaces by hand. Age had also crystallized the glue joining the legs to the seats; Papp removed the old glue from the affected joints, heated it, and then reapplied the revitalized solution. The seats’ Italian-made fabric, Papp says, came through five decades without a rip or a stain. Eugene Luther Gore Vidal is born in West Point, New York, where his father teaches aeronautics. He later shortens his name in honor of his maternal grandfather, Thomas Pryor Gore, a Democratic senator from Oklahoma. Vidal’s first novel, Williwaw, written when he was 19, is published. The New York Times refuses to review Vidal’s third book, The City and the Pillar, because of its depictions of homosexuality. Vidal turns to writing mystery novels to support himself, using the pseudonym Edgar Box. Under contract to MGM, Vidal helps rewrite Ben-Hur but is not given screen credit. Vidal announces his candidacy for Congress to represent the 29th District in upstate New York, employing the campaign slogan “You’ll get more with Gore.” He loses the election but makes a strong showing among the largely GOP constituency. Julian, about 4th-century Rome, tops the Herald Tribune best-seller list, beating out Leon Uris’s Armageddon. a libel suit. Buckley settles for $115,000. Governor Jerry Brown and Vidal vie to be the Democratic nominee for the U.S. Senate. A collection of Vidal’s writing, United States: Essays 1952-1992, wins the National Book Award. Among his other literary successes is Lincoln, which was released in 1984 in a remarkable 200,000-copy first printing. Vidal puts his L.A. house on the market for $2.1 million, but it fails to sell.